Monteverde which means ‘green mountain’ in Spanish, is a small and beautiful village founded by a Quaker community in the 1950’s. 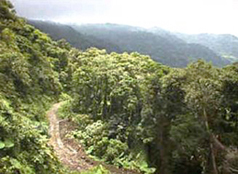 Located in the mountainous area above Puntarenas this region is now famous for being associated with the Monteverde Cloud Forest Reserve, The Santa Elena Cloud Forest Reserve and the Children’s Eternal Rain Forest. Tourists will find a wide variety of fauna and plants in all of these 3 parks. Monteverde and its neighbouring town of Santa Elena feature many nice hotels – it is a delightful destination for visitors who like to experience the natural beauty of Costa Rica. This area offers a lot of attractions and activities that combines nature and adventure. In Monteverde travelers can enjoy the wonderful view of the cloud forest that surounds the whole area, and in which more than 400 species of birds and more than 3000 species of plants were discovered. Or enjoy the view of the Gulf of Nicoya from the distance, or swim in the cold water of the San Luis waterfall, visit the famous cheese factory, hike to the top of Cerro Amigos, or walk to one of the viewpoints where it is possible to see the Arenal Volcano. Upon arrival in Monteverde, you will find that much of this village remains untouched by modernity, and most of the people here still lead rural lives, although there are many elegant restaurants, hotels, banks, souvenir shops and cafes.